After being eradicated in the United States in 2000, measles is making a comeback. There were 349 cases of measles diagnosed in 26 states in 2018. As the trend continues this year, there’s a common thread: Most cases involve unvaccinated people. With the disease and outbreaks making headlines, I’d like to address some common questions, concerns and myths about measles and its vaccine. Measles is a highly contagious viral disease that often occurs during childhood. 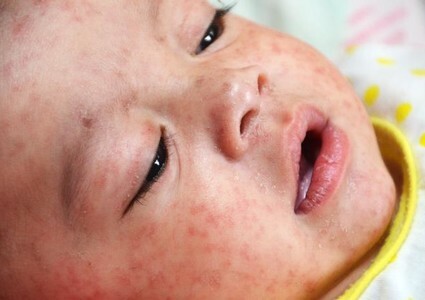 A child in the Philippines with measles is seen in 2014. While most people have no lasting problems after about two weeks of the illness, some can develop serious complications such as pneumonia, encephalitis (inflammation in the brain) or death. According to the American Academy of Pediatrics, about 450 people died each year from measles before there were routine vaccinations. That worked out to about one to two deaths for every 1,000 people infected. Most of the victims were previously healthy children. The measles virus is extremely contagious. It is spread through the air when someone coughs or sneezes, and it can live on surfaces for up to two hours. Why are there outbreaks if measles was gone in the U.S.? In the year 2000, the U.S. had seen no spread of the virus for more than a year. Unfortunately, though, when people who are not immunized travel to areas that have measles, they can contract the illness and bring it back. As the number of unimmunized people increases, the virus is more likely to spread to others and cause more infections. 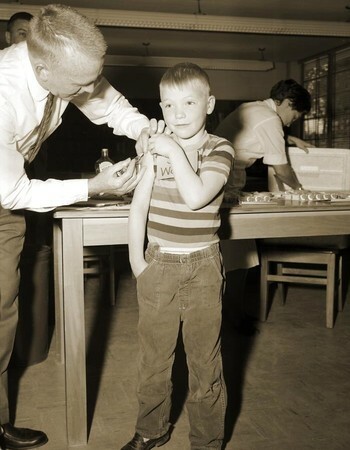 A boy gets the measles vaccine in school in Atlanta in 1962. How does the measles vaccine work? The MMR vaccine protests against measles, mumps and rubella. The MMRV vaccine, which also protects against chickenpox, also is an option. They work like all other vaccines: by exposing your body to a safe version of the virus (called an antigen) so it can make cells (called antibodies) to fight a future infection. Think of it as your body’s army capturing a spy so your soldiers can be ready whenever an attack happens. Most people are vaccinated against measles twice, once when they are 1 year old and again before they go to kindergarten. One shot of the measles vaccine is about 93 percent effective in preventing the disease. If you have both doses as recommended, it is more than 97 percent effective. The immunity that a person gains from the two shots is typically lifelong. If everyone else has the shot, why does my child need it? Don’t others who’ve gotten it provide protection? It’s true that having everyone else immunized can provide some protection to those who haven’t been vaccinated. This is called herd immunity, and it happens when enough people (generally more than 95 percent) are protected that the virus or bacteria can’t spread enough to cause major outbreaks. However, this only works if everyone who can be vaccinated has been. As more parents decide not to vaccinate their children, the disease is more likely to spread. Herd immunity protects those who are too young (less than 1 year old) or are otherwise too sick to get normal vaccines. It is not a substitute for being immunized. Herd immunity protects those who can't get vaccinations. It is not a substitute for being immunized. However, the benefit of staying healthy from the vaccine vastly outweighs any risk from it. The measles vaccine is much safer than getting measles itself. I’ve heard that the measles vaccine has preservatives, toxins and chemicals; I don’t want to inject my child with that! 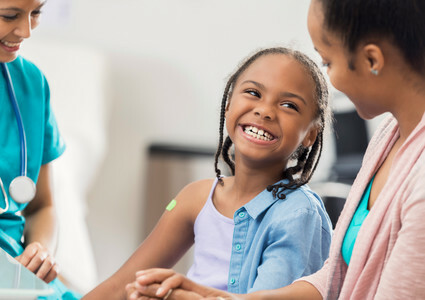 While it’s true that some vaccines have preservatives and components that can sound scary or be considered “toxins” or “chemicals,” the vaccines and shots your child receives are completely safe. Period. The only ingredients in vaccines are ones that are absolutely necessary to keep the shots safe and effective. Keep in mind anything can be considered a chemical or toxin. Water is both! Too much water can be toxic, and it’s made up of the chemical components of hydrogen and oxygen. The measles vaccine has no dangerous mercury, aluminum, formaldehyde or other chemicals/toxins as people often claim. Additionally, babies and children have no difficulty clearing or processing any components of the vaccine. Does the measles vaccine cause autism? No. There have been hundreds of studies researching any link between autism and vaccines, especially the measles vaccine. Every reputable study has shown no evidence whatsoever. The American Academy of Pediatrics, the Centers for Disease Control and Prevention and the World Health Organization agree that vaccines are safe and do not cause autism. The myth comes from a study published in 1998 by a British doctor who was later found to have made up data. Unfortunately, autism usually becomes apparent and is diagnosed around the same time children receive numerous vaccines, leading many people to jump to conclusions. Measles and its vaccine can be confusing and overwhelming, especially with the news of outbreaks and the availability of misinformation online. I can state with complete confidence, however, that the measles vaccines is safe and arguably the single best thing parents can do to keep their children safe, healthy and protected during such outbreaks. My sons have both been vaccinated for measles (as well as everything else that’s recommended) because I know it will help them lead the healthiest lives possible. If you have questions or concerns about measles or its vaccine, don’t hesitate to talk to your pediatrician. Learn more about measles and its vaccine at cdc.gov/measles. Learn more about recommended immunization schedules for children. Make an appointment with Dr. Matthew Gibson.